Find everything you need for a great party in Auckland. We can help you plan and book your party or a weekend get away. Check out our great selection of activities, things to do in Auckland or simply give the office a call and talk to one of the party planners. When it comes to having an epic, memorable and a guaranteed great party in New Zealand, you have to talk about Auckland. There is just so much cool stuff to get up to here that fitting it all in is a problem…….. but that is a pretty damn good problem to have if you ask me. There is a ton of touristy stuff to get up to here. Many people love to check out the Sky Tower or have a little walk down by the famous harbor which are two of the most iconic things in Auckland. No matter if you are coming with the kids or some friends, Auckland is a place that really does have something for everyone. One thing that makes, Auckland such a great place is that this is the major metropolitan city in New Zealand, but despite having a ton of cool stuff and everything else you would expect in a major city it still has something of an island charm to it. As a huge city and a major tourist hotspot, Auckland is perhaps the easiest place to get to in the whole of New Zealand. You can get a coach here from pretty much anywhere. Most roads will lead to here or simply jump on a place. In all getting to Auckland is not going to cause you any problems at all. As a matter of fact it being so easy to get here just makes coming here even more attractive. Especially if you are travelling with kids or adults who like to whine like babies! Like most other major metropolitan cities around the world, Auckland has a fantastic public transport system that keeps the city ticking. Busses are available to take you to most of the major tourist locations and there is what seems like about ten billion and a half taxis on the road. You can hire a car if you want to drive yourselves, but the public transport is so good here it would be a shame not to make use of it. 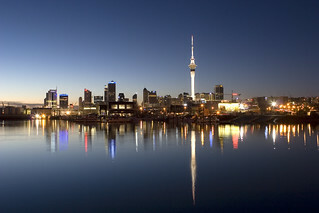 Auckland is the main tourist location in New Zealand and as a result it is always pretty busy, but the “peak” months of November to March are when the city is at its busiest. If you are looking for a sun soaked holiday though this is the time you guys will want to visit. If you want to save a few bucks, have smaller crowds and still have a great holiday then you should look into visiting Auckland between April and October the weather is not as hot, crowds a little smaller and most room rates are a heck of a lot cheaper! One cool thing about Auckland is that no matter what time of year you visit there is always a crazy amount of cool things for you to get up to. Auckland is a pretty major player when it comes to sports. The Blues play in the Super Rugby competition and there is also the New Zealand Warriors who play rugby league. There are a few smaller rugby teams in the city as well. If rugby is not your thing then do not worry as there is also The Auckland Aces cricket team, New Zealand Breakers basketball team and the footie teams, Auckland City and Waitakere United. So as you can see there is a lot of sport happening here so no matter if you are a guy coming on a blokes holiday, a family looking to check out the local sports or a group of ladies looking for an excuse to watch fit men in shorts, you can do it all here in Auckland. You know there is just so much stuff to do here in Auckland that just picking a handful of them is going to be really hard! But you are guaranteed an awesome time at any one of these places. The Sky Tower: This is what tourism in Auckland is all about! The Sky Tower is the most popular tourist attraction and it will be a huge hit and a lot of fun no matter if you are here with your friends or the family. This thing is freaking huge! You can go right up to the top in a glass elevator so you can see the whole city as you do! It is more like an amusement park ride than anything else. 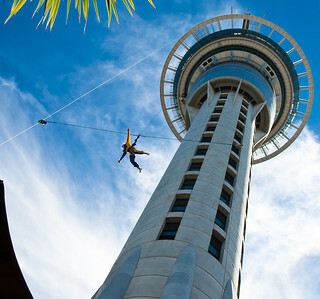 You can take the Sky Walk where you see if you are brave enough to walk around the outside of the tower…… with a safety harness of course and you can even bungee jump off the Sky Tower. With places to eat, things to learn and other things to see and do. No visit to Auckland is complete without a visit to The Sky Tower. Auckland Zoo: You can tell how good a zoo is by the number of animals that could kill you….. Well that is what I think! Anyway, Auckland Zoo has the largest collection of amazing looking, cute, weird, dangerous and exotic animals in the whole of New Zealand. This is just such a great day out and you will. They have elephants, monkeys, crocodiles and a million creepy looking bugs and reptiles as well. If you have seen it on the Discovery Channel then chances are you can see it here. This place is awesome and they do actually have a lot of shows and exhibits on as well which are a lot of fun to check out especially if you have kids with you as some of them are interactive. Rangitoto Island: Take a trip to the volcanic paradise that is Rangitoto Island. There are a number of boat tours that will take you to this island and let you walk to the top and let me tell you it is pretty damn cool. You can even take a guided tour and learn a little about this amazing island. If you want to get out of the city and see some of the real New Zealand then this is the best way to do it. How many chances in life do you get to check out a volcano! Having a few drinks and laughs with your friends or stopping off for a breather so you can have a beer and the kids can have a coke. Auckland has a number of places that will let you “wet your whistle” keep you refreshed so you can keep you Auckland adventure going. The Fox: The Fox is one of the premier sports bars in Auckland if there is a ball involved or some buy jumping over something then you bet they will be showing it here on their large screen. While this is a sports bar they also serve up some very nice food and they do offer a fun and friendly atmosphere. Even if you are not into sports and get dragged along with your group, you will still enjoy yourself here. Sky Lounge: As you may have guessed the Sky Lounge is located in the epic, Sky Tower. This is a bar that is so high in the air that birds have been known to slam into it…… well not really, but it is bound to have happened a few times right? The Sky Lounge does have a great wine list and all your favourite drinks, but it is really the experience of drinking while watching the world go by hundreds of feet down below that is the draw here. Cassette Nine: If you want to go to a bar that is just flat out cool and awesome then you do not get much more cool than Cassette Nine. This just ticks all the boxes of what makes a really fun bar. To start with they have great deals on drinks all the time. They have some nice food (especially their burgers) and they also have live bands playing here most weekends. For you folks who want to have a few beers in style then this is where you need to come. If you are kid free during the evening then you can party it up at one of these awesome, Auckland nightclubs! Goldfinch: This is a really fun place to have some drinks and have a great evening. What is awesome about this place is that by day it is a cocktail bar, but by night it is a nightclub where you can let your hair down and party. Goldfinch is ideal if you do not want to go on a long drawn out pub crawl and just want to spend your whole evening in the one place. The Lounge: The last club (ok so this is technically a bar) that I want to suggest is The Lounge. This is a really cool and hop type of place that specializes in playing hip hop and R & B tunes. For you guys and gals who like to have a more laid back type of party, The Lounge is just ideal for you. With guest DJ’s playing some awesome sets and some pretty phenomenal deals on drinks, The Lounge is somewhere if you are coming to Auckland for a wild weekend that you have to go to. Eating should be fun and right down below I have the most fun places where you and your family can enjoy a nice meal. Dante’s Pizza: You know when a pizzeria is sending a chef to compete in a “world pizza championships” that they are serious about their pizza. Pizza is the perfect holiday food. No matter if you are here with your friends or the kids. Pizza is one food that pretty much every one likes…… well most normal people do. They have a great selection and man these things are just incredible. If you love pizza, you will be in heaven here. Burger Queen: Yes that is right, Burger Queen not King! Burger Queen serve up some of the most incredibly huge burgers you will ever see! Not only are these things monstrously huge, but the burgers they grill up are just second to none. What makes this ideal is that they cater for everyone. You can have a huge burger with tons of fillings or you can just have one of their delicious patties and a bun. The Ancient Mariner: For some real authentic Kiwi style fish and chips, you really cannot beat The Ancient Mariner. Wow the fish here is just delicious, virtually bone free, gorgeous batter and the chips they serve up with it are mind blowing. This is the kind of place where you will eat your fish and chips, take a few steps away from the restaurant and think “hmmm, maybe I could handle another portion” that is how good the fish and chips are here.